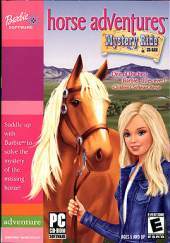 Barbie puts on her detective hat when Teresa's prize horse disappears on the eve of a big competition. Foul play seems likely. Barbie and friends must hone their riding skills, untangle puzzles, jump a variety of obstacles, uncover clues, and solve the mystery. Gameplay involves caring for horses by feeding them carrots, apples, and sugar cubes. Environments include an abandoned campsite, an old town, a cave, and more. Mix and match outfits to create the perfect riding gear for Barbie. Solve puzzles and avoid obstacles as you explore the trails. Search on horseback or foot for clues and special surprises. It uses the Renderware game engine.